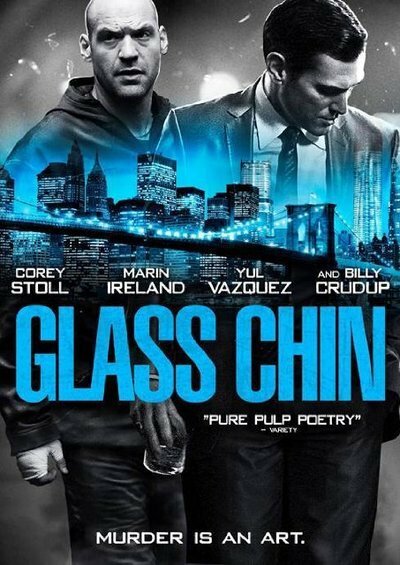 The plot of “Glass Chin” is familiar: A down-on-his-luck former boxer named Bud “The Saint” Gordon (Corey Stoll) works as an enforcer for local New Jersey gangster J.J. (Billy Crudup). Bud spends his nights visiting J.J.’s loansharking victims, and his days training a young welterweight named Kid Sunshine (Malcolm Xavier). When Bud’s enforcer colleague Roberto (Yul Vasquez) kills a man during a shakedown, J.J. frames Bud for the crime. Unless Bud can convince Kid Sunshine to throw the fight, J.J. will release to the cops footage of Bud entering the victim’s apartment, “incriminating” him in the crime. Caught between a rock and a hard place, Bud makes a series of bad decisions that may lead to his downfall. My description may have conjured up several movies in your mind, movies about dive-taking boxers or low-level criminals undone by their own stupidity. There really is nothing new under the Sun, especially in the realm of neo-noirish flights of fancy like this. But the true measure of a good tale is in the telling, and writer-director Noah Buschel spins his yarn in an unexpected, ultimately satisfying fashion. This is a boxing movie without a scene of the climactic match, a murder movie with no onscreen violence and a character study where people discuss philosophical quandaries on a whim. It is extremely talky, sometimes to its own detriment, and the first 20 minutes or so may prove too off-putting for the casual viewer. I admit the director’s vision took some getting used to, with its long takes and penchant for framing characters looking at the camera while talking to someone off-screen. However, once I acclimated to Buschel’s rhythms and became invested in the all-around solid acting by the cast, I found much to enjoy. Part of the fun came from realizing how subtly Buschel plays the required notes in stories like this, and how strangely he plays them. For example, the lead character’s motivations hinge on his desire to reopen a restaurant closed by his boss and tormentor. Considering the outcome of “Glass Chin,” it must have been a damn good restaurant. Bud does not live up to his saintly boxing moniker. He’s cheating on his live-in girlfriend Ellen (Marin Ireland) and, as Ellen points out in the film’s best monologue, The Saint hasn’t been very good to her. In many scenes, he’s verbally abusive, though Ellen gives as good as she gets. We also see Bud insulting a homeless man who recognizes Bud from his failed boxing career, a career that the film hints was derailed by Bud taking more than one dive. Bud doesn’t want Ellen to work, and the lack of anyone bringing in a steady income influences the unwise choices Bud makes. Yet, “Glass Chin” isn’t as dismissive of Bud as it feels on first blush. Late in the film, Stoll and Ireland play a quiet, beautifully rendered scene of naked vulnerability. The stresses of Bud’s choices take their toll on him, and he breaks down in Ellen’s arms in the shower. The scene is completely unexpected, framed in such a way that it looks as If the walls are literally closing in on them. Buschel’s script concerns itself with the rambling dialogue his characters utter to pass the time, but his direction does all the storytelling. Some very good acting distracts from the film's less successful patches. The always-welcome Kelly Lynch makes the most of her few scenes as Mae, a bartender with whom Bud has a past and current sexual history. New York Dolls’ David Johansen has an effective cameo that evokes memories of his turn in the “Cat from Hell” section of “Tales from the Darkside: The Movie.” Crudup is quietly menacing as J.J., a mobster whose art gallery ownership seems completely at odds with the less-refined tastes one expects from this type of character. And Stoll is excellent at capturing the essence of a broken-down palooka; he physically wears the weight of the world on his shoulders, adding a few extra pounds because he knows many of his problems are self-inflicted. Bud is not likable, and at times he’s just plum stupid, but Stoll makes you care enough to keep watching him. I don’t think “Glass Chin”’s last reel thesis on how the rich manipulate the poor is convincing, but I admired that Buschel gave Roberto the chance to broach the idea. I also liked the inconclusiveness of the film’s last scene. Is Bud’s last line referring to an act of defiance or desperation? “Glass Chin” becomes far more interesting upon reflection, which isn’t a bad thing if you can get on its wavelength.